If you are a contractor, you probably already know what raised access flooring is. If you are a business owner considering hiring a contractor to perform new construction, then you need to know what it is. It is a great idea that has many benefits. Firstly, the term raised or raised access simply means any flooring type that gives an elevated structural floor above any solid substrate such as concrete. This type of flooring creates a tunnel-like area that can serve as a passageway for electrical and mechanical services. This area is hidden from view. 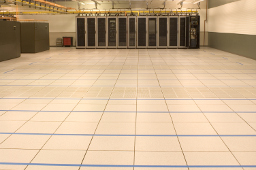 This type of flooring is mostly used in modern commercial buildings and offices, as well as IT data centers and command centers. One main benefit is in computer rooms where the hiding of many wires is necessary. And currently in the United States, the popularity of under floor air distribution is on the rise. It is quickly becoming the easiest way to cool a building, by easily circulating air throughout the building. Under floor ventilation will require automatic fire protection shut-offs and suppression systems should an under floor fire occur. Raised access flooring is often installed in varying heights, ranging from two inches to four feet in height, depending on its use. The higher the flooring is from the substrate, the more support is built into it. Most often is the case when raised flooring is high enough for a person to crawl through. And be prepared for any smoke detectors you have installed in your under floor area if you are having work done there. Once your wiring is installed, the panels of a raised floor are rarely, if ever, lifted and cleaned under. Dust and a bountiful assortment of dirt and debris will collect amongst the wiring and ductwork. So, if you need to have work done in that area, you may want to call Mike Rowe because it will be one dirty job! Workers can disturb the dust and set off those smoke detectors resulting in a false alarm and possible panic in the work place. So, although it doesn’t happen on a regular basis, it is always recommended that you keep your raised floor areas clean and as dust free as possible. So, now that you have a little bit of information on raised flooring you may just find that it is the perfect solution for hiding all of your wiring and similar things during your new construction. Believe me; nobody likes that old closet at the end of the darkest hallway in the office that is filled with hissing and stinky wires!